A slightly shorter alternative hike to the Cadillac South Ridge Trail, the Cadillac North Ridge Trail starts at the opposite end of the mountain at a trailhead along the Park Loop Road just .2 miles past the start of the one-way section. 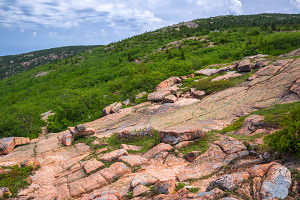 This easy-to-follow trail makes a slow and steady ascent though a few sections of pleasant forest to reach the higher sections of interesting pink granite formations, offering expansive views to the north. 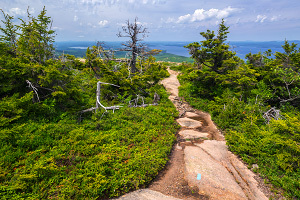 While this is arguably the least interesting trail to the top of Cadillac Mountain and cars on the nearby Cadillac Summit Road may prevent any wilderness experience, this is still a pleasant hike. 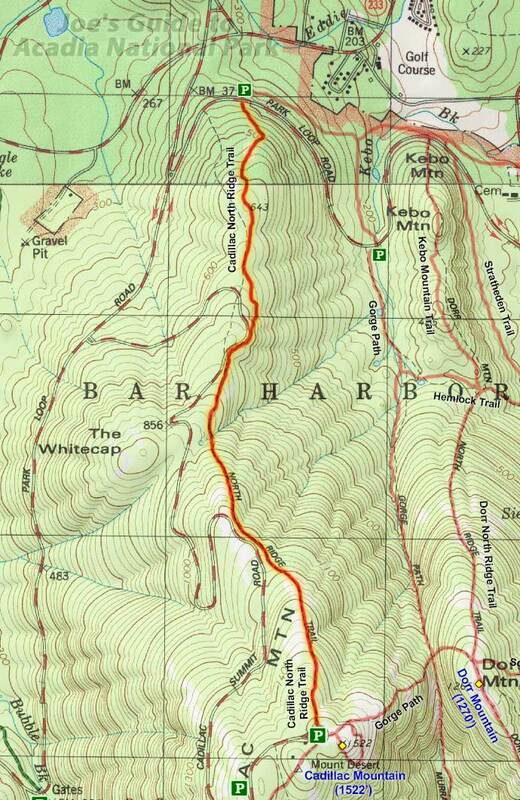 To get to the Cadillac North Ridge Trailhead from Bar Harbor, take Eagle Lake Road (Route 233) and then turn south on the Park Loop Road. Roughly half a mile south is the start of the one-way section of the loop road. (Just a bit further south is the Cadillac Summit Road if you want to take the easy drive to the summit.) Drive .2 miles on the one-way road and you will see the trailhead marker and signage on the right (south) side of the road. Limited roadside parking can be found nearby. Hiking the Cadillac North Ridge Trail is pretty straightforward. The lower sections of the trail are forested but soon give way to the more open views as you gain elevation. As with many other peaks on Mt. Desert Island, beautiful pink granite formations can be seen everywhere. The trail does brush against the Cadillac Summit Road a few times which admittedly ruins any sort of wilderness experience. As you make your way up the mountain, be sure to look behind you to the north for increasingly beautiful views. After about two hours of leg-burning uphill, the trail will top out at the north end of the summit parking lot which is typically swirling with cars and people during the summer months. Continue around the parking lot to the south side to tag the summit and stroll around the summit loop trail. While this is a perfectly fine trail, the slightly longer Cadillac South Ridge Trail would probably be a more interesting hiking option due to its more remote and diverse scenery. If you have a car spot or want to use the free Island Explorer shuttle during the summer months, a few interesting options would be a through hike up the South Ridge Trail and down the North Ridge Trail or a loop hike up the Gorge Path and then back down the North Ridge Trail. When you think of idyllic spots in Acadia, Jordan Pond probably comes to mind with its pristine calm waters surrounded by lush, majestic mountains in all directions. The Jordan Pond House (rated one of the best restaurants in any national park) is conveniently located on the south side of the pond and offers up wondrous views of the Bubbles (South Bubble Mountain and North Bubble Mountain) across the water. Before or after having afternoon tea and popovers (reservations recommended), a stroll around the Jordan Pond Trail (Jordan Pond Loop) is a wonderful leisurely activity while offering up great scenery. Rating: Easy family stroll on a paved path. As the trail loops around the western side of Jordan Pond, things get a bit more interesting as the path makes its way around a few big boulders along the shoreline, then the gravel path turns into an elevated log boardwalk that takes you over the last mile of wetlands near the shore. Soon enough, the loop is completed and you will be standing back on the south side at the end of the lawn in front of the Jordan Pond House. The stroll around Jordan Pond is a classic leisurely Acadia hike, especially if you can tie it in with tea or a meal at the Jordan Pond House. The views of the pristine waters reflecting the beautiful curves of the Bubbles can't be beat. Please note that while this is a leisurely and family-friendly path, it could get a bit monotonous for younger children as the terrain may start to feel repetitive.